Address: , Adeje (Tenerife), Islas Canarias. Villa María Tipo is a self-catering accommodation located in Adeje. 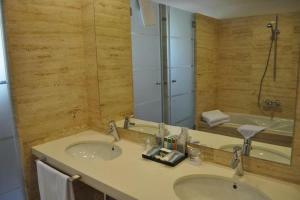 The property is 2.0 km from Siam Park and 3.8 km from Aqualand. The holiday home will provide you with a TV with satellite channels, air conditioning and a balcony. Complete with a microwave, the dining area also has a refrigerator. There is also a private bathroom with a bath or shower. There is an additional bathroom. Guests can enjoy the patio. The complex has two swimming pools on different levels (one heated). They are located in the central part of the complex. There is also a children's pool. There are also sunbathing terraces and Pool Bar. From La Caleta you can walk to a natural beach which is only 5 minutes away. The Bahia Del Duque is a white sandy beach and is approx a 15 minute walk along the coastline. Tenerife Sur Airport is located 18 km from the property. Please note, you need to leave your credit card number for the security deposit. Final cleaning is included in rental price. Bed linen, bath towels and kitchen linen are included in the room rate. Please note that the full amount of the reservation is due before arrival. Belvilla will send a confirmation with detailed payment information. After full payment is taken, the property's details, including the address and where to collect keys, will be emailed to you.